I would love to produce meals every night that I’ve lovingly prepared with an abundance of fresh ingredients. Who wouldn’t? But let’s face it, in reality there are just some days when you have destroyed the house with the latest craft project and the kids are covered in glitter and you have to choose between bathing them or cooking for them and they’re already started crying that they’re hungry but they are twinkling like glittery stars and every time they move they are like shooting stars. Stressed much? In situations like that, I always have to opt for the bath and steel myself for a super speedy supper that I need to magic from thin air! For days like this, I have a handful of go-to recipes that I know the kids will love and that I can prepare in a heartbeat. The added bonus with this recipe is that it’s super cheap and you can batch make for the freezer too which makes it even quicker when your life is stuck together with gloopy glue! I know you’re a busy person if you’re reading this recipe so I’ll get straight on with it! The first job is to peel and chop your potatoes. The smaller you chop, the quicker they will cook! Boil the spuds until tender and then mash with your favourite vegan butter and milk. While the potatoes are cooking steam your veg. Soften the garlic and then add all of the other ingredients including the steamed veg and stir. Add to an oven dish and top with the mashed potatoes. To shake things up you can change the vegetables you use or the herbs. 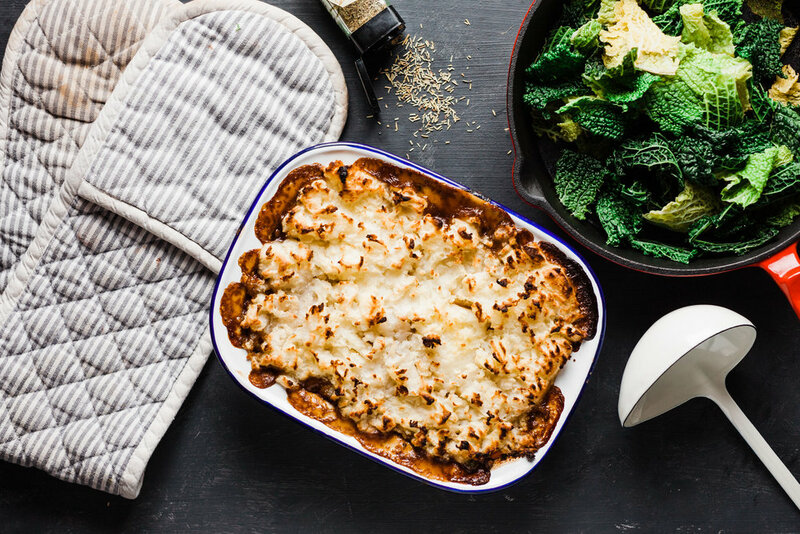 You could use sweet potatoes or top with vegan cheese and breadcrumbs but in essence, this is the quickest and cheapest vegan shepherds pie that will satisfy your now nicely squeaky clean little monkeys and you! I’d love to hear from you if you have any other super quick and easy vegan recipes. Because let’s face it, most days life runs away with us and you find yourself faced with the challenge of making dinner an hour ago! Thanks for reading guys.